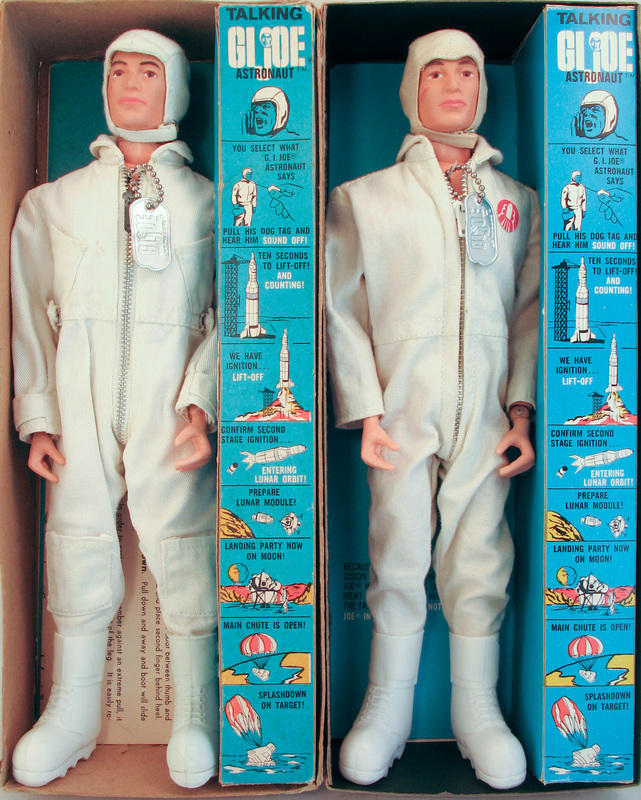 The 1969 Talking Astronaut (7915) makes eight different statements about a lunar mission when his dog tag is pulled. 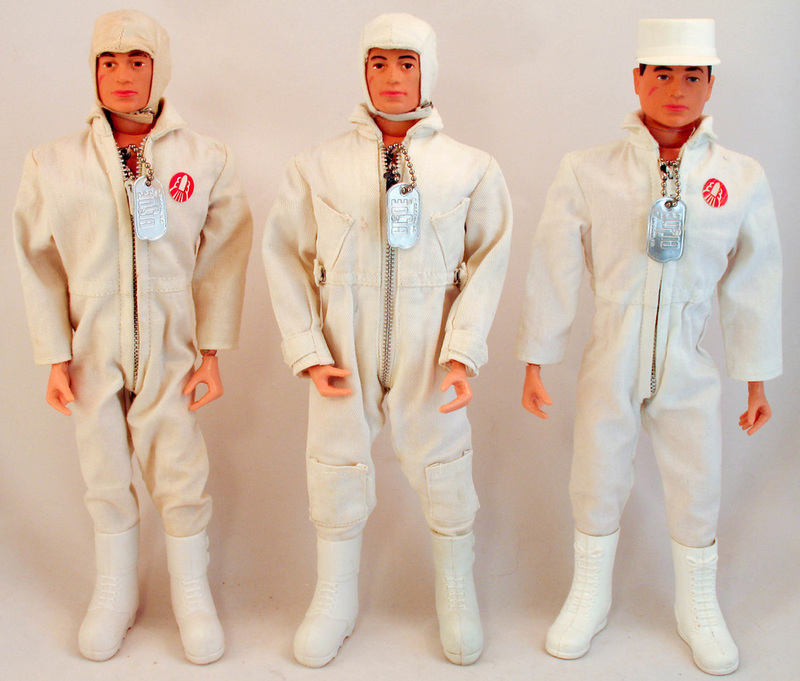 The set was issued with a number of variations, including a very hard to find white jumpsuit with four pockets like the scramble pilot's uniform, a white cloth skullcap instead of the plastic cap above, and waffle boots instead of the tall white combat boots pictured. The cleated boots first appeared in the Actions Sailor Deep Freeze set in 1967. Below, hear what the Astronaut has to say, courtesy of Canadian collector Duane Smailus! Note the cloth cap pictured on the insert. It was removed for the 1970 release of the figure. Below, three variations. Cloth and plastic capped figures in plain suits flank a figure in the four-pocket suit. The four-pocket suit is bit of a mystery, discussed below. Note the tall white combat boots on the figure with the plastic cap. These appear on some of the later 1969 figures and 1970 sets. They are not from the Deep Freeze set as reported by some sources, as they have never appeared in that packaging. 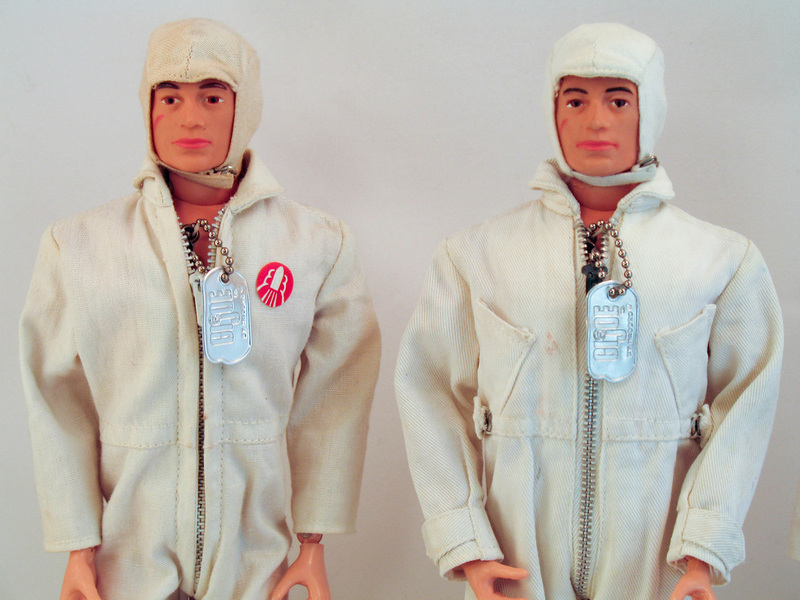 The bulk of 1969 Talking Astronauts were issued with a simple white poly/cotton jumpsuit with a white zipper pull. This suit was used right through the early 70s for the flocked hair Adventure Team figure, and is considered the standard outfit. Less common is the white four-pocket suit, made from a pattern and twill fabric identical to the jumpsuit of the scramble pilot. This suit is also a bit of a mystery, both because of its rarity and the ease with which it could be counterfeited by removing color from a late-issue scramble suit. Evidence of whether the suit was an official release is scant. Some say it was the first issue outfit for the set, others say it was a Sears exclusive. There is even potential for it to be a fantasy item. Below, a scan from the 1969 Hasbro sales catalog. The four pocket suit shown is clearly a prototype with a plastic rather than metal zipper, and a simple red dot insignia rather than the later red and white rocket emblem. 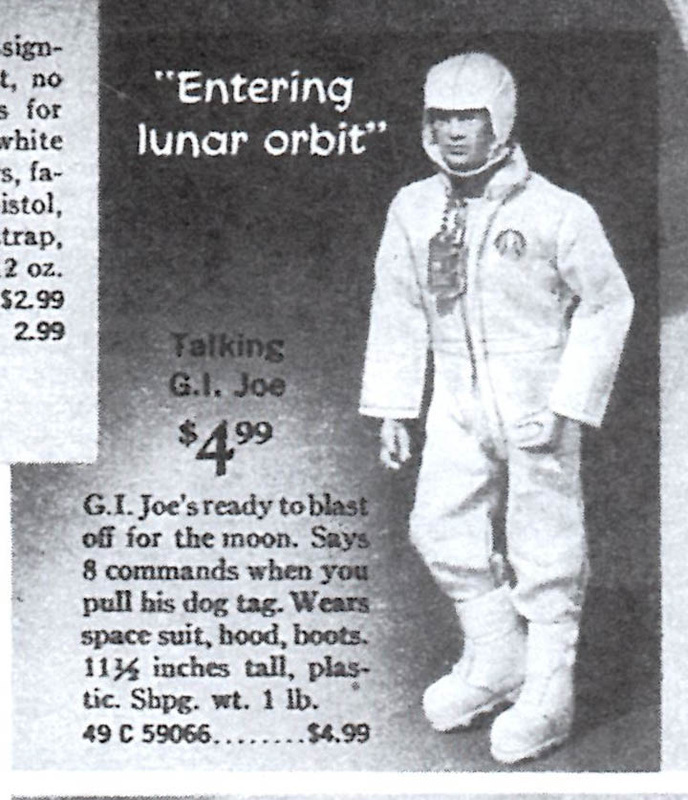 This scan from the 1969 Sears Christmas Wishbook shows the cloth cap version of the Talking Astronaut, though it is depicted wearing the plain version of the suit. Low resolution cuts detail, but this doesn't seem to have pockets. The four-pocket set shown below came in what appears to be its original box, and is shown here side-by-side with a standard issue set. The bottom of the box top has the Sears catalog number (59066) for the Talking Astronaut written on it in grease pencil. There are faint blue marks on the back of the suit which may be from laying on the colored insert. Though it came through the collectors' market, which can make it suspect, this set was allegedly purchased from a doll collector, so there is less likelihood the suit would have been swapped out. That said, there is no definite proof either way, and the set and box show play wear, so they have been handled by previous owners. So why doubt the authenticity of the four-pocket astro suit? It is virtually unheard of for the suit to be found in mint, unplayed with condition in the box, so there is a paucity of evidence of the suits being original. In addition, the tags on the suits are almost universally frayed on the edges. The example above has this fraying, which can be evidence of the sizing being soaked out of the tag, allowing the edges to unravel. That said, the same thing can happen when suits are played with by kids. Another indication of soaking is missing teeth on the zippers, which is seen frequently on these jumpsuits. In addition, the fabric is a polyester-cotton blend that tends to get yellow or brownish when soaked in a solution of standard bleach. It may well be that collectors trying to clean their suits have cast doubts on authenticity by trying to whiten them with standard laundry products. Collector and dealer Joe Iazzetta brought up the idea that Hasbro itself may have originally bleached or removed the dye from surplus Scramble suits, which is an interesting theory. 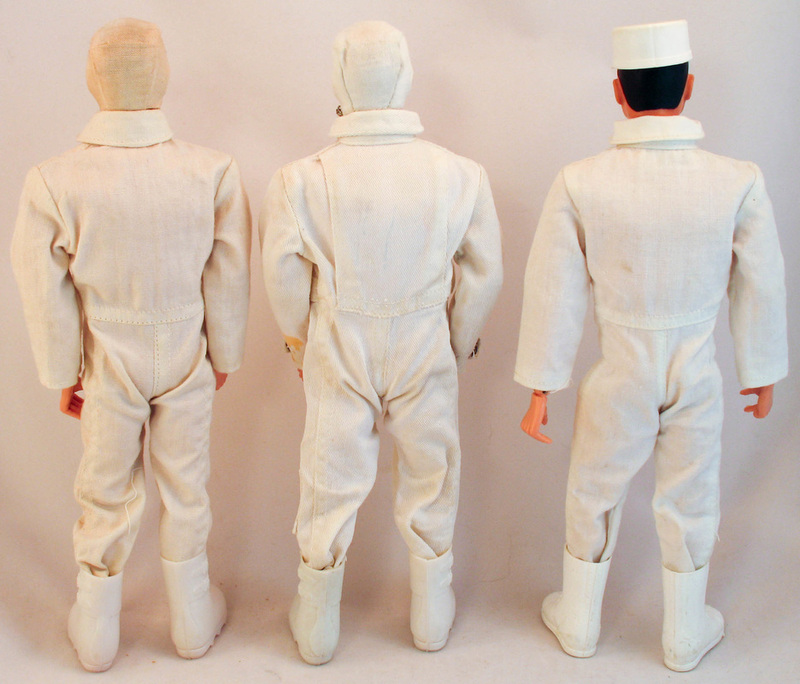 Perhaps orders of the plain white suits were behind at the factory, so this was done to fill early orders with existing stock of four-pocket jumpsuits. If this is the case, then all examples started out light grey and were soaked, leading to loose zipper teeth and tags with frayed edges. Until stronger evidence of authenticity appears, these suits will remain a mystery for collectors to decide about on their own.